I'm so glad you wrote a piece on tech because, to be honest, it's been one of my biggest worries, and perhaps misunderstandings, when it comes to the theory behind unschooling. At my job, I see young kids, 6/7/8 years old coming in with iPads, apple watches, iPhones, earphones in at all times and it scares me. In fact it kind of disgusts me, not to sound judgmental or anything it's the world we live in. But as far as the theory behind unschooling, my husband has asked me "but what if she just wants to watch TV all day? We're supposed to just let her, right?" and the mom gut in me immediately screams "absolutely not!" ... but I guess I don't really know the "unschooling" answer. Unlimited/unrestricted TV or tech has been studied and shown to have negative effects on children's brain development, so I don't really feel comfortable letting her "do whatever she wants" on that front. In addition some unschooled adults I know have attested to the only "failures" they've seen in unschooling attributable to unrestricted tech. 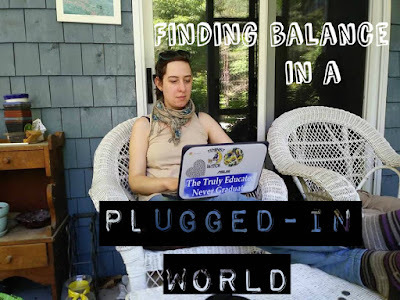 But then, if I place rules on tech, am I really unschooling? How do I approach this? Thanks in advance! Secondly my post What Makes Unschooling Successful? Advice From Grown Life Learners: http://yes-i-can-write.blogspot.com/2018/03/what-makes-unschooling-successful.html Where 10 different grown unschoolers share what they found most positive about unschooling, and several cite unlimited/mostly unlimited access to technology. Full-disclosure: one grown unschooler who answered felt differently, but they only shared so in response to others sharing positive screen experiences, and since I was really looking for the first thing that came to people's minds when asked the question "what did you find especially positive about unschooling/something you think your parents did especially well?" and not to host a back-and-forth on any one topic, I chose not to include that portion of their response in the final post.